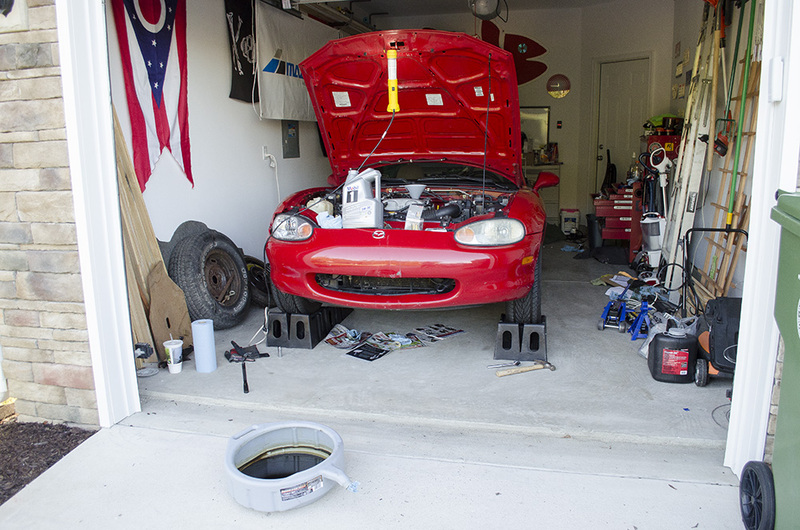 The previous owner had again inflicted minor damage to the front end, but the frame remains straight and everything was in decent working order. 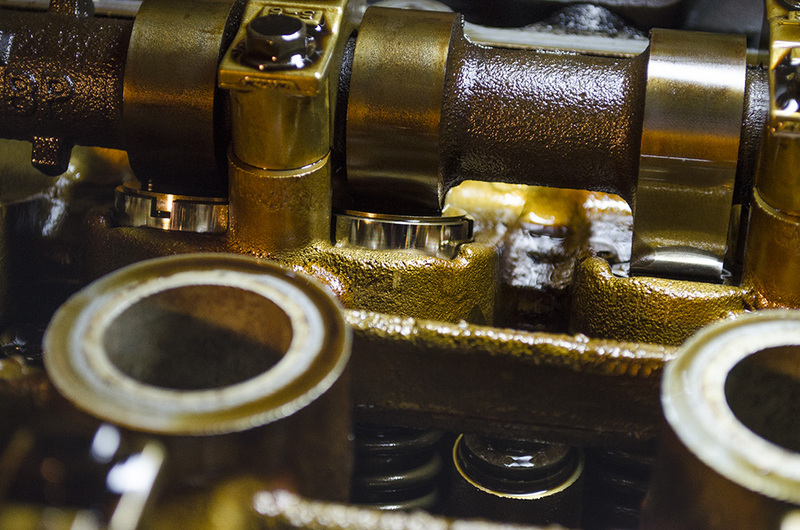 The salvage title reduced the cost of the car by about half of the clean title cars around. Luckily my friend, Kyle was available to ride along and give his more experienced input on the car. We identified it was low on oil and immediately after purchase tracked down the nearest auto parts store. 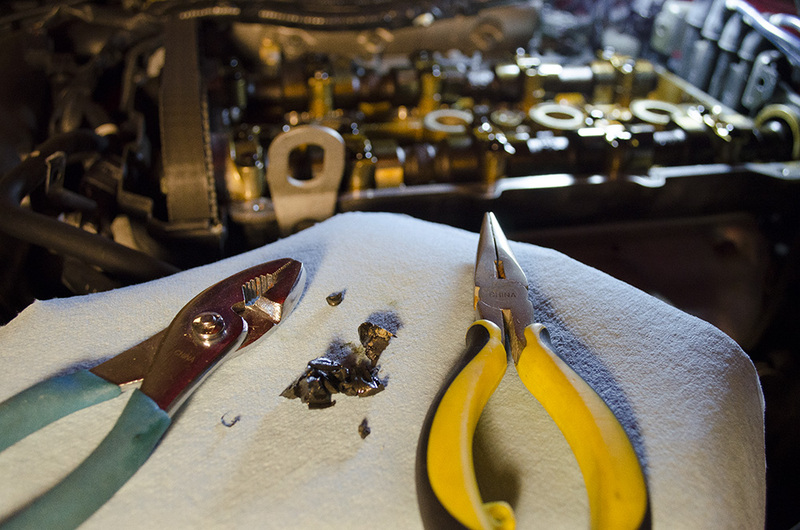 One and a half quarts of oil and a cheap pair of gloves to open the oil filler cap that was nearly welded to the valve cover and it was ready to drive the 2 hours back home. Sunday it was time to make some trips to the auto parts store and get to work! On the up side, the car seems overall to be a great value. The down side is the list of maintenance that needs to be performed, but I knew what I was getting in to. 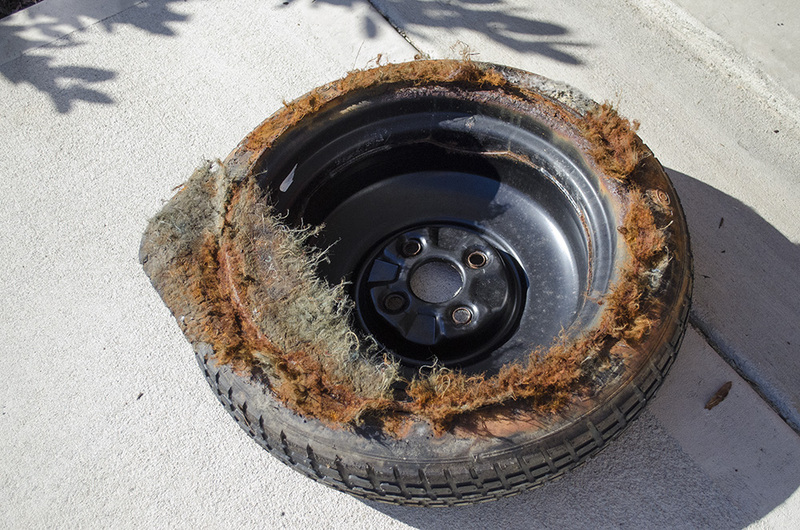 To start off the list, the padding in the trunk was fused to the spare tire which at this age is due for replacement anyhow. The jack, and other truck accessories were in pretty bad shape, so they'll sit in the garage and await replacement. 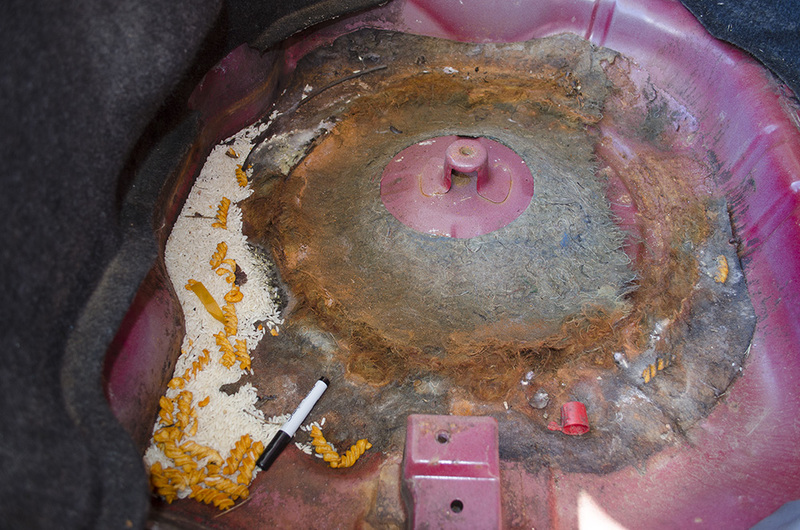 The bottom of the truck was fairly rusty, which is mostly a result of a 15 year old cloth top that is no longer draining properly and water backing up into the trunk. Either the previous owner tried to soak up the extra water with rice and Frito chips, or this is just an emergency snack compartment. Vacuum solved that pretty quick. 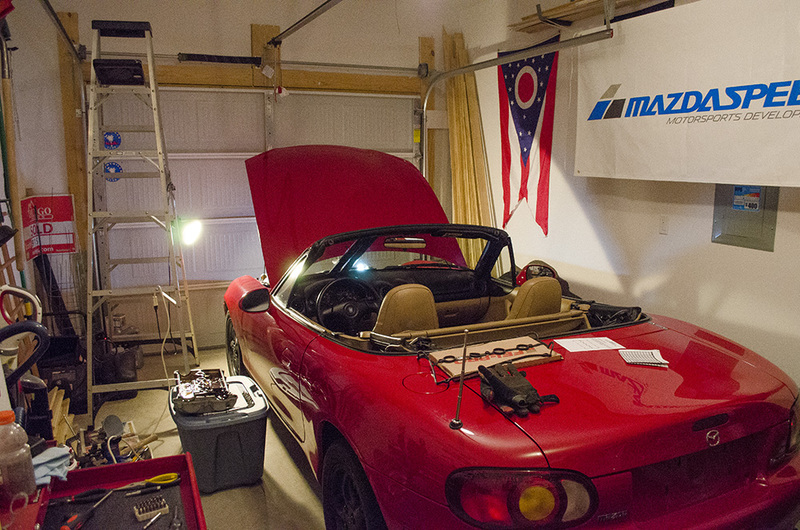 The battery (in the trunk in Miatas to keep weight distribution almost exactly 50/50) was a cheap brand that was entirely too big and was barely fitting. Easy replacement, no harm done. After clearing out the trunk, replacing the battery, swapping out the worn out tires with the backup set I still had around from the MSM (coincidentally a set from another 99 and exactly like the ones this car came with), it was time to turn to the engine. We knew the valve cover gasket was bad and slowly dribbling out oil, and it had been running low on oil when I bought it, so it was due for an oil change and a new gasket. 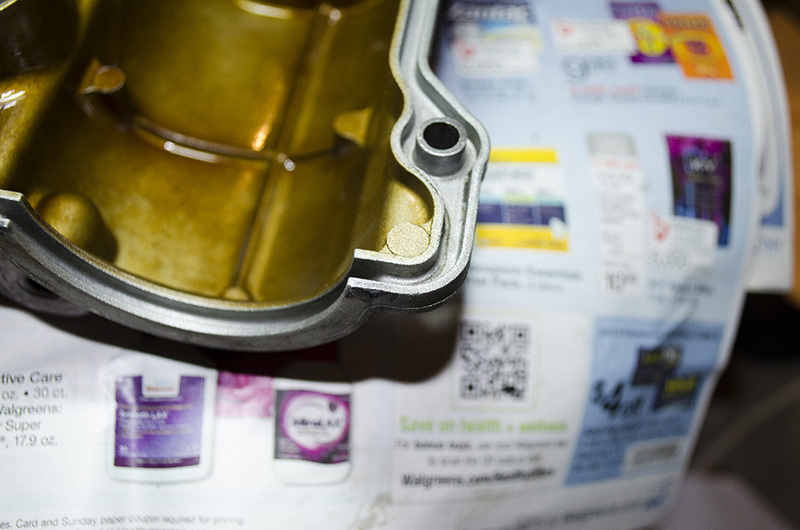 This was uncharted territory for me, but with Kyle's occasional guidance through text message I tackled pulling the cover off the engine, meticulously cleaned it and replaced the gasket. Had to carefully remove little bits of silicone that are dabbed on to help seal it. 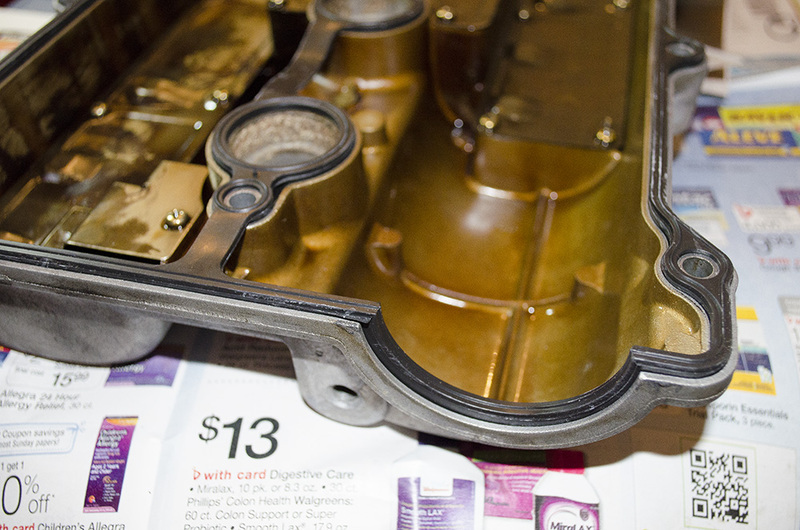 Thoroughly remove any oil from the groove where the gasket will sit. Install the new gasket. Piece of cake and no special tools needed. Sunday was starting to run out of daylight, and the previous owner had employed the Hulk to fasten the oil drain plug too, so I opted for some sleep and tackle the rest on Monday. I was able to get off of work early to get to the DMV to officially register the car in South Carolina and run out to pick up a few more odds and ends. Returning to the garage I finally broke loose the oil drain plug, finished the oil change with some full synthetic and put the new plate on the back. Just as the sun was hitting the tops of the trees out to the West, I ran out to properly dispose of the used oil and get a couple shots in. 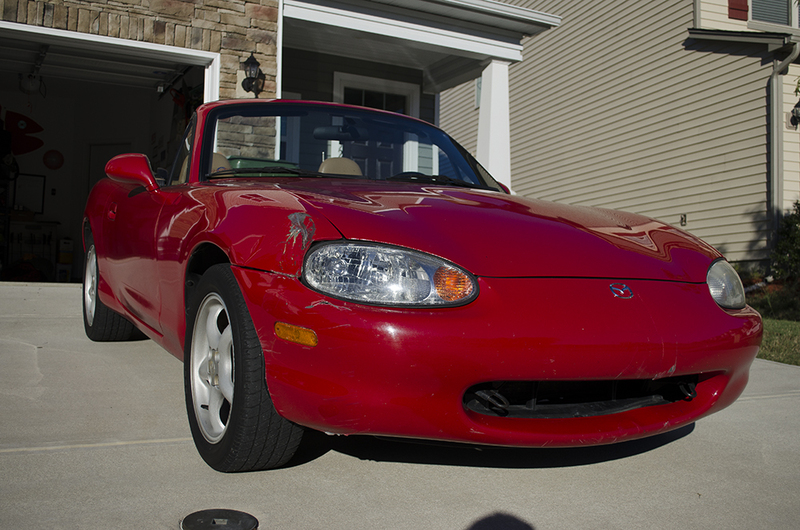 The list of maintenance continues with orders placed online for new tires, brake pads, rotors, window guides and grease (since the driver's window barely moves), a replacement soft top (no, they don't hold up for 15 years too well), shifter items, and a few more fluids. Even with all of these maintenance items, many of which may need to be done on any used car of this age anyway, I've still not spent more than my initial budget of $4000. 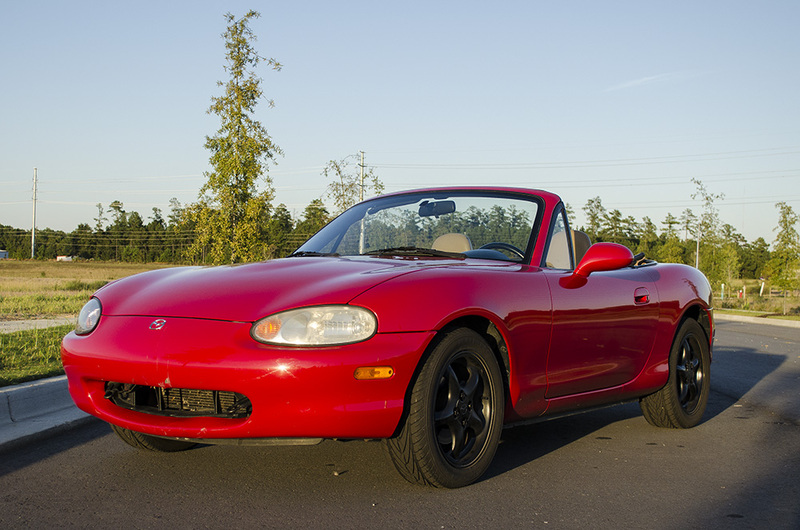 Other than replacing the damaged body panels, which shouldn't be too costly at all with the huge selection of Miata parts in the world, it's going to be one fine running machine. Stay tuned as it progresses. Thanks for the write-up. Looks like fun. How did the Fritos taste? Tasted better than the rice! I mean, no, I did not eat or taste anything that came with the car.